For the ultimate show of nature and wildlife, Fiordland and Southland are the regions to visit. The secluded beauty of the Catlins, home to the yellow-eyed penguins, is a magnet for many. Others come to get a taste of southern hospitality at its best, visiting Invercargill and Bluff (world-famous for its oysters). Southland is also the launching pad to the remote Stewart Island. On the west, the World Heritage-listed Fiordland region features the iconic Mitre Peak, Milford and Doubtful Sounds. It is also a haven for hiking with three “Great Walks” – the Routeburn, Milford and Kepler tracks. Your chances of seeing pods of dolphins or penguins and seals is higher in Doubtful Sound than Milford Sound as the former is more remote. Lake Hauroko is the deepest lake in the country. Millford Sound is one of New Zealand's most popular tourist attractions, welcoming more than 14,000 visitors to Milford Track each year. Sample some of the delicious Bluff Oysters, harvested from March to August. Take the Southern Scenic Route and see the spectacular Purakaunui Falls. Take a walk through the beech forest of The Catlins River Wisp Loop. Explore Te Anau’s network of glowworm caves. Visit Lake Manapouri, one of the most picturesque lakes in the world. 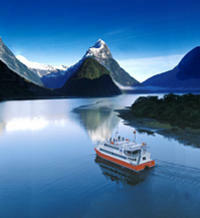 Cruise the Milford and Doubtful Sounds. Plan a multi-day hike into Fiordland. Invercargill is New Zealand’s southernmost city. Known as the City of Water and Light, it is characterised by striking Victorian and Edwardian architecture and wide-open spaces. The city has a strong mix of Maori and Celtic influence, and is an ideal base for exploring the far south. Queens Park in the city centre is a beautiful area with numerous features including rose gardens, duck ponds, aviaries, a water park and a vast amount of beautiful landscaping and walking tracks. Head to Misty Oreti Beach where you can see Stewart Island directly in front or Riverton towards the right. Just twenty minutes from Invercargill is the small town of Bluff, New Zealand’s southernmost town and home to the oyster, considered among the best in the world. Stirling Point is the southern mainland point of New Zealand, located at the end (or beginning!) of State Highway One. Stewart Island is a short ferry ride across the Foveaux Straight. The Greenpoint picnic area has a viewing platform overlooking a ship graveyard, and Bluff Hill, or Motupohe, provides excellent panoramas from the viewing platform and several highly recommended walking tracks. The secluded Stewart Island is home to only 400 people, and is accessible via Invercargill or via ferry and helicopter from Bluff. Located about 30km off the south of the South Island, the island is a sanctuary for many native birds and has the largest kiwi population in New Zealand. Rakiura National Park covers more than 80% of the island, with dense coastal rainforests, freshwater wetlands, vast sand dunes and granite mountain ranges. The park is home to the 36km Rakiura Track, one of New Zealand’s Great Walks, with scenery that has barely changed in thousands of years. The Catlins is renowned for its rugged beauty and access to wildlife. With hidden lakes and stunning waterfalls, the wide-open space offers fantastic stargazing opportunities. Nugget Point is home to fur seals, sea lions and elephant seals that can be seen sunning on the rocks of various beaches. You may also see yellow eyed and blue penguins, and Hector’s dolphins can often be seen playing in the waves. The striking Purakaunui Falls cascades 20m in three tiers, while the most amusing waterfall is the Niagara Falls, which falls less than a metre! Curio Bay is home to the fossilised remains of a Jurassic forest, and the amazing Cathedral Caves rise more than 30m ceiling-high in places. As Southland’s second largest centre, Gore has a colourful history and was part of the region that saw the last of Maori intertribal warfare fought on its lands. Gore is the brown trout capital of New Zealand, with the Mataura River running through the centre of the town. The world-class fishing on the Mataura River and its tributaries has earned the district the title of World Capital of Brown Trout Fishing, and the large brown trout statue in the town is a national icon, and is photographed by thousands of tourists each year. Air New Zealand provides daily flights into Invercargill from Christchurch or Wellington, with flights from all other major cities and towns around New Zealand into those two centres. Shuttle services link the airport to the city. If you are exploring Southland via the Southern Scenic Route you may choose to fly into Queenstown or Dunedin. Stewart Island Flights provides daily scheduled flights between Invercargill and Stewart Island. Daily ferry services also connect Bluff to Oban in Stewart Island. Te Anau in Fiordland is between 2 to 2½ hour drive from Queenstown or Invercargill, and around a four hour drive from Dunedin. Regular coach services, special tours and shuttles are available into the area. Manapouri is 20km south of Te Anau. Spring (Sep-Nov) – crisp and clear with frequent frosts, 5-14°C; Summer (Dec-Feb) – hot and dry, 21-28°C; Mar-May – crisp and clear with frequent frosts, 6-15°C; Winter – frosts and snow, 2-8°C. Passing through ice-carved valleys and beech forest, the 32km Routeburn Track is among the most popular Great Walks of New Zealand. A month of extraordinary arts events around the region, showcasing some of the best work from around the country, as well as highlighting local creativity. Read more. Splendid isolation, stunning beaches and glimpses of the past dot the Rakiura Track in Stewart Island. Read more. Visit the predator-free Ulva Island, just a 15-minute water taxi ride from Oban on Stewart Island. Make sure you visit Bluff during the oyster season, so you don't miss out on this delicious seafood! Be sure to kayak in the Doubtful Sound as dolphins often swim along with the kayaks. When visiting the Caitlins area be sure to stop at Kaka Point located approximately 15 minutes out of Balclutha. Take a walk to the lighthouse and get up close to the famous nuggets or take a walk down to the beach and be just metres away from the pengiuns and seals!